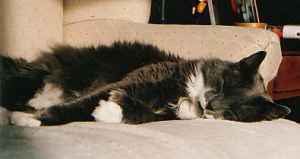 Marianne writes, "Butchie was adopted to a loving home around Halloween of '98. After a few bloops consisting of falling off of the sofa in getting acclimated to people furniture rather than concrete and junk piles, he has become a favorite in a five cat home. "Butchie took very little "work" and responded very quickly to positive attention and affection; he is the biggest mush cat there is. He is quite vocal and loves to sing arias, plays and sleeps to the sincere delight of his housemates. We love him so very much and are ever so grateful to Kitty Angels for filling a hole in our home we didn't even know we had. Butch is the greatest cat; we hope you too will discover what cats like Butch can offer you as they ask so little and give so much. Thank you for finding him. We are more than grateful he found us through Kitty Angels." 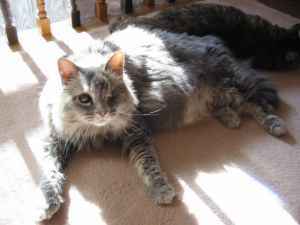 Gigi was adopted, at the age of six months, in October 2000 by Kathy, who writes, "She had just returned from her Veterinary visit and had not been named yet. I saw her at PETsMART on Saturday and thought about her all night and rushed back on Sunday to bring her home. I don't know why I waited so long. It was one of the best decisions I have made. She has brought so much joy, not just to myself but my whole family, especially my niece and nephews who love to play with her and she tolerates it quite well. She is a very sweet and very spoiled girl who loves to play and be held. She definitely has a little attitude about her, but that's what makes her fun. Her favorite spots are my side of the bed and the bathroom sink where she loves to quench her thirst and take a little bath. She seems very happy in her home....but who wouldn't when you're the 'Queen'. I bet she receives more Christmas presents than me again this year. Thank you Kitty Angels!" Charlie (left), aka "Msr. 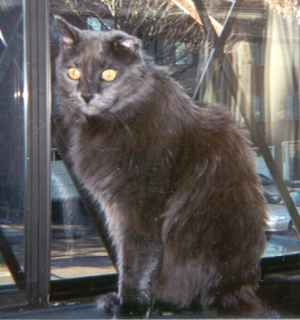 Charles Le Maison-Chat", was adopted, along with Chef and Joe (above), by Wendy - all the cats are FIV-positive. 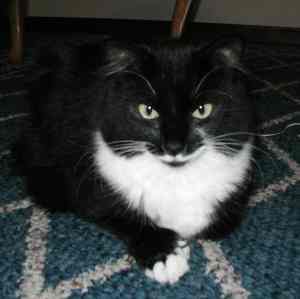 Wendy tells us that everyone, including another cat Rocketman, adopted from another shelter, are doing fine and have become good friends and companions. Betsy was adopted by Diane in October 1991. Diane writes, "She has been 10 years of love and affection. While nobody seems to agree, I still believe she has some very limited sight. However, she seems to use the movement of my feet when she wants to stay right beside me. She still plasters herself against me, under the covers at night."